Departments of Neurology (DMM, RF, NK, SLM) and Health Information Technology (MS) and Center for Biomedical Research Informatics (SAW, JCS), NorthShore University HealthSystem, Evanston, IL. We describe quality improvement and practice-based research using the electronic medical record (EMR) in a community health system–based department of neurology. Our care transformation initiative targets 10 neurologic disorders (brain tumors, epilepsy, migraine, memory disorders, mild traumatic brain injury, multiple sclerosis, neuropathy, Parkinson disease, restless legs syndrome, and stroke) and brain health (risk assessments and interventions to prevent Alzheimer disease and related disorders in targeted populations). Our informatics methods include building and implementing structured clinical documentation support tools in the EMR; electronic data capture; enrollment, data quality, and descriptive reports; quality improvement projects; clinical decision support tools; subgroup-based adaptive assignments and pragmatic trials; and DNA biobanking. We are sharing EMR tools and deidentified data with other departments toward the creation of a Neurology Practice-Based Research Network. We discuss practical points to assist other clinical practices to make quality improvements and practice-based research in neurology using the EMR a reality. To address these unmet needs, we created a quality improvement and practice-based research initiative in neurology using the EMR. We present a step-by-step description of our quality journey for 10 neurologic disorders (brain tumors, epilepsy, migraine, memory disorders, mild traumatic brain injury [mTBI], multiple sclerosis [MS], neuropathy, Parkinson disease [PD], restless legs syndrome, and stroke) and for brain health (risk assessments and interventions to prevent Alzheimer disease [AD] in targeted populations). The Department of Neurology at NorthShore University HealthSystem (NorthShore) includes 40 neurologists practicing at 4 hospitals and 8 outpatient sites in the north suburbs of Chicago, IL. The neurologists include generalists and subspecialists in epilepsy, neurodegenerative disorders, MS, neuromuscular disorders, neuro-oncology, sleep disorders, and stroke. Figure 1 illustrates our stepwise process of quality improvement and practice-based research using the EMR. 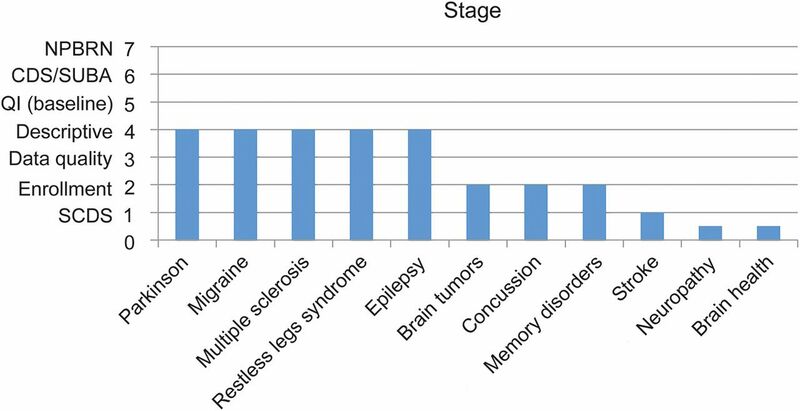 Figure 2 illustrates our progress for 11 projects (10 neurologic disorders plus brain health) as of April 1, 2015. 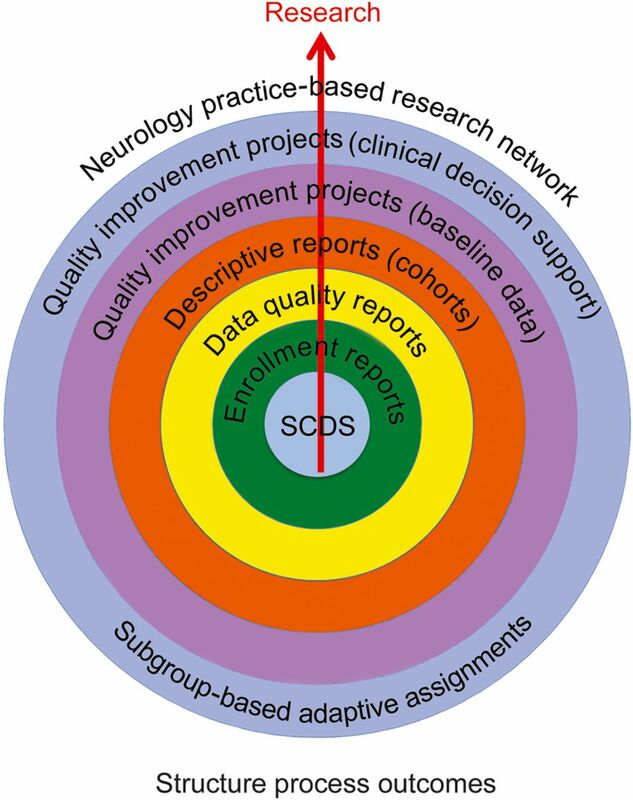 Quality improvement and practice-based research in neurology using the electronic medical record (EMR) consists of a stepwise progression from the development and implementation of structured clinical documentation support (SCDS) toolkits (including note writing and electronic data capture); to enrollment reports; to data quality reports (and data cleaning); to descriptive reports of cohort characteristics; to quality improvement projects (including the creation of benchmark data and quality improvement dashboards); to the use of clinical decision support tools (to hardwire patient safety and improved outcomes); to the use of subgroup-based adaptive assignments (in support of pragmatic clinical trials and personalized medicine); to other research (e.g., biobanking of DNA and the association of genotypes with longitudinal outcomes). The EMR provides a framework for measuring and impacting the 3 dimensions of quality improvement: structure, process, and outcomes. The x-axis lists each of the quality improvement and practice-based research projects in order of implementation at the NorthShore site. The y-axis indicates the quality improvement and practice-based research stages. The bars indicate the stage of completion as of April 1, 2015, for each disorder. CDS = clinical decision support; NPBRN = neurology practice-based research network; QI = quality improvement; SCDS = structured clinical documentation support; SUBA = subgroup-based adaptive assignments. We optimized our EMR (Epic Systems Corporation) by building structured clinical documentation support (SCDS) toolkits that standardize office visits, write progress notes, and capture data. The process of creating the 11 SCDS toolkits (1 per project) is as follows. We conducted meetings with the neurologists in each program every 2 weeks to select a disorder that is prevalent, variable, and unpredictable and to standardize the content of progress notes (to define the disorder, specify its outcomes using validated measures, and document associated factors). We consulted the medical literature, AAN guidelines,11 National Institute of Neurological Diseases and Stroke Common Data Elements,12 and subspecialty guidelines.13 We envisioned standard workflows (the order and assignment of tasks to a care team that included a medical assistant, sometimes a nurse, and a neurologist) and progress notes (the order and layout in which the content would write). We limited the medical assistant and/or nurse assessments to 15 minutes each and the neurologist assessment to 60 minutes. Content building required 3 months per project. We then conducted meetings with programmers from NorthShore's EMR Optimization team every 2 weeks. They built SCDS toolkits that included navigators (a sidebar list of activities assigned to a workflow, with links to electronic forms), electronic forms (modules that included discrete data fields with mouse-click selection of variables represented by radio buttons, tabs, or drop-down menus and additional branching logic, autoscoring, and auto-interpretation features), and summary flow sheets (of prior test results or office visit information). We included optional free text fields (for typing additional comments or narrative history or the impression and plan). The toolkits were designed to support initial and long follow-up visits (conducted annually per our Best Practices, except for malignant brain tumors [every 6 months] and mTBI [at 2 weeks and 3 months]). The toolkits were also designed for optional use at interval visits (e.g., for medication adjustments or review of test results). The SCDS toolkits were designed to support clinical practice and research. For example, an electronic pop-up box was built to prompt neurologists to enroll eligible patients in a DNA biobanking initiative. When the neurologist selected enrollment within the pop-up box, an electronic notice was sent to the research team to prompt consenting and blood drawing at the point of care or to document nonparticipation (and why). EMR building required 3 months per project. The neurologists tested the SCDS toolkits in the EMR's development environment. Revisions were made and the toolkits were moved to the EMR's production environment. The project team continued to meet every 2 weeks to make revisions based on patient encounters. Implementation required 3 months per project. In total, SCDS toolkit development required 9 months per project, and we worked on 3 toolkits a year (one undergoing content building, another EMR building, and another implementation at any time). Our toolkits focused on outpatient visits using the EMR's ambulatory environment (except for brain tumors, which used the EMR's hospital outpatient visit environment). As of April 1, 2015, 8 SCDS toolkits have been used several thousand times at routine office visits. Appendix e-1 at Neurology.org/cp provides screenshots of our toolkit for PD. After each SCDS toolkit implementation, neurologists met every 2 weeks with programmers specialized in extracting, transforming, and loading data from the EMR's relational data repository to project-specific data marts in NorthShore's Enterprise Data Warehouse (EDW). The data marts provide an interface for analytic tools. Up to 1,000 fields of data were captured per office visit. Neurologists provided input as to which tasks were required at initial and long follow-up visits and data were binned accordingly. Within 1 month of project implementation, the EDW programmers created reports to track research enrollment in our DNA biobanking initiative. The enrollment reports are generated monthly. Tables indicate the number of participants by ethnicity and race or by month and year; the number of initial or follow-up visits per year; a listing of enrollees (including dates of consent and initial and follow-up visits, and annotations regarding death, withdrawal from the study, invalid consent, screen failure, or pending blood draw); and a summary of longitudinal follow-up (including numbers of patients actively followed, past due, pending due, or not due; and follow-up rates). Once enrollment reports were produced, project team meetings transitioned to monthly intervals. After project-specific data marts were created and enrollment reports were available, the EDW programmers created data quality reports (as early as 3 months after an SCDS toolkit was implemented). These reports indicated which of the required data were missing for each office visit. Data quality reports are distributed to the care team monthly. Data not cleaned within 3 months were archived as permanently missing, and those data were not listed on subsequent reports. The care team learned where they were error prone from the data quality reports, and they remediated their use of the toolkits. When systematic errors occurred for many providers, the teams had the opportunity to improve their use of the toolkits or to request optimizations or a change in data requirements. The monthly reports produced only a few or no data checks per provider once projects were established. Once we enrolled 100 patients into a project and cleaned the data, a statistician created a descriptive report of the cohort. These reports include frequencies, medians, and ranges and bar and box plots for multiple fields of data and score tests (in the sample overall and in strata). These reports are generated quarterly, and by reviewing descriptive data at the cohort level, neurologists identify opportunities for quality improvement. Appendix e-2 provides a sample descriptive cohort report for migraine. Each neurology team envisioned 3 quality improvement projects using the SCDS toolkits, data, and reports. They developed projects using experience, medical literature searches, and additional Web site resources.11 Some quality improvement projects and measures were crosscutting but others were disorder-specific. Table 1 provides a list of quality improvement projects, disorders, and measures. We are analyzing baseline data for the first 100 patients enrolled per disorder and for the first year of follow-up to define quality benchmarks. The neurologists will review quality improvement “dashboards” quarterly. We expect to improve quality by standardizing office visits using SCDS toolkits and by regularly reviewing enrollment, data quality, descriptive cohort, and quality improvement dashboard reports. As an added safeguard we are creating electronic pop-up boxes (best practice advisories [BPAs]) that fire at the point of care whenever a quality improvement opportunity is identified, based on data captured by the EMR. Neurologists will conduct pragmatic trials using the EMR for 10 common neurologic disorders. Table 2 lists the disorders, compared treatments, and outcomes. Our captured data will trigger BPAs prompting reassignment when a “to be compared” treatment is prescribed. For example, a neurologist might prescribe pramipexole to a patient with PD but be prompted to consider ropinirole or rotigotine instead. We will integrate with the EMR subgroup-based adaptive design (SUBA) software that uses data captured from the patients previously enrolled in a given trial to identify subgroup effects and to assign patients newly enrolled in the trial to treatments that are expected to be more effective in real time.16 The statistical features of SUBA include the continuous learning of patient subgroups based on a random partition model and the adaptive allocation of patients to the best treatment based on posterior predictive probabilities.17,–,24 SUBA has desirable performance in computer-simulated trials with a sample size of 300. We created a neurology practice-based research network (NPBRN) using the EMR. We are sharing SCDS toolkits and data for quality improvement and practice-based research. We obtained a list of Epic clients and invited neurology practices to join the NPBRN. The AAN is providing guidance regarding integration of quality measures into the EMR and assisting with recruitment of sites and dissemination of findings. Details are as follows (see also appendix e-4). A. Sharing of SCDS toolkits. NorthShore is sharing its toolkits for 10 neurologic disorders with the other neurologists under a free license sharing agreement. Sharing of tools will be achieved via the EMR's application exchange. This will substantially reduce the work of installing toolkits from one health system to another. B. Sharing of deidentified data. The neurologists will share deidentified data captured by the SCDS toolkits (minus protected health information). The NPBRN will govern the use of the shared data collaboratively. We expect no overlapping patients (1 site per state). C. Data management. NorthShore will manage the data in collaboration with other NPBRN sites. Data submitted to the EDW will be the object of constant monitoring. We will provide monthly encounter (akin to enrollment) reports and data quality reports, and quarterly descriptive cohort and quality improvement dashboard reports to participating neurologists. A driver of our quality journey at NorthShore has been our department's biobanking and research informatics initiative. Neurologists are enrolling 1,000 patients in each of 11 SCDS cohorts. Following informed consent and with institutional review board approval, enrollees provide a blood sample for DNA and plasma storage and permission to associate information in their blood with information in their medical records. We will use this resource for molecular prognostic studies. Appendix e-5 summarizes biobanking as of April 1, 2015. From the point of view of practicing neurologists, our use of the EMR may seem futuristic. Many neurologists do not use an EMR or have limited capabilities for its optimization or data sharing. Nevertheless, we conclude by addressing many practical points to assist other clinical practices in making quality improvements and practice-based research using the EMR a reality. Our objective was to stay “time neutral.” We encouraged neurologists to pilot test the SCDS toolkits in the EMR development environment and we placed frequent requests for optimizations post implementation. Our new office visits and long follow-up visits are 60 minutes each (neurologist component) and we support our neurologists with medical assistants or sometimes nurses, but the time and resources allocated can easily be reduced because of the modular build of our toolkits. Other neurology practices may choose to designate some toolkits (navigators) or modules (electronic forms) as required and others as optional or to implement neurology office visit workflows including students, residents, fellows, physician assistants, or advanced practice nurses (in addition to or instead of medical assistants and nurses). We also hope that EMR vendors will incorporate SCDS toolkits similar to ours and make them broadly available to clients as part of their standard products. Once common data elements are extracted, transformed, and loaded into a data warehouse (regardless of the EMR platform), the same enrollment/encounter, descriptive, and quality reports can be used and the quality improvement initiatives can be the same. The AAN is creating a registry (the Axon Registry) to demonstrate the quality and value of neurologic care, to support improvements to care, and to alleviate the administrative burdens of quality reporting for payment and maintenance of certification.33 Data captured using SCDS toolkits such as ours can be easily exported to the AAN registry, forgoing the need for extraction software, natural language processing, or chart abstraction. The authors acknowledge the generous funding support of the Auxiliary of NorthShore University HealthSystem and thank the medical assistants, nurses, neurologists, EMR Optimization and Enterprise Data Warehouse programmers, administrators, and research personnel at NorthShore University HealthSystem who contributed to the quality improvement and practice-based research initiative using the EMR. The authors thank Vimal Patel, PhD for his assistance with editing, formatting, and submitting the manuscript for publication. We also thank the principal investigators of the neurology practice-based research network and Becky Schierman, MPH and Dr. Timothy Pedley of the American Academy of Neurology for their collaboration. Finally, the authors thank the neurology patients who inspire us to improve quality and to innovate our clinical practice. Demetrius M. Maraganore: drafting/revising the manuscript, study concept or design, analysis or interpretation of data, acquisition of data, statistical analysis, study supervision, obtaining funding. Roberta Frigerio: drafting/revising the manuscript, analysis or interpretation of data, acquisition of data, study supervision. Nazia Kazmi: drafting/revising the manuscript, acquisition of data, study supervision. Steven L. Meyers: drafting/revising the manuscript, analysis or interpretation of data, acquisition of data, study supervision. Meredith Sefa: drafting/revising the manuscript. Shaun A. Walters: analysis or interpretation of data, acquisition of data, statistical analysis. Jonathan C. Silverstein: drafting/revising the manuscript, study concept or design, acquisition of data, study supervision. Targeted study funding is provided by the Agency for Healthcare Research and Quality grant 1R01HS024057-01 “Quality Improvement and Practice Based Research in Neurology Using the EMR,” awarded to D.M.M. on June 30, 2015 (after this paper was accepted for publication). D.M. Maraganore has received philanthropic support from the Auxiliary of NorthShore University HealthSystem; serves on the editorial board of Parkinsonism and Related Disorders; is an author on 2 pending patents: (1) method to treat Parkinson's disease and (2) method to predict Parkinson's disease; and receives research support from GE Healthcare and the Agency for Health Care Research and Quality (1R01HS024057-01). R. Frigerio's spouse has received philanthropic support from the Auxiliary of NorthShore University HealthSystem; serves on the editorial board of Parkinsonism and Related Disorders; is an author on 2 pending patents: (1) method to treat Parkinson's disease and (2) method to predict Parkinson's disease; and receives research support from GE Healthcare and the Agency for Health Care Research and Quality (1R01HS024057-01). N. Kazmi is employed as a Clinical Research Associate at Cepheid and serves as a consultant for Nutrabiotix, LLC. S.L. Meyers and M. Sefa report no disclosures. S.A. Walters is employed as Senior Programmer/Analyst at NorthShore University Health System. J.C. Silverstein serves on a scientific advisory board for Western Governors University Health Professions Council; is cofounder of Computationdoc LLC; receives research support from Baxter, a Patient-Centered Outcomes Research Institute subgrant from Chicago Community Trust CDRN CAPriCORN, and a Centers for Medicare and Medicaid Services subgrant from University of Chicago; and is President and CEO of the Joseph H. Kanter Foundation, a 501c3 doing health care research (salary support to NorthShore as release time). Full disclosure form information provided by the authors is available with the full text of this article at Neurology.org/cp. The article processing charge was paid from the Research and Development Fund of the Department of Neurology at NorthShore University HealthSystem. ; American Academy of Neurology Parkinson Disease Measure Development Panel. Quality improvement in neurology: AAN Parkinson disease quality measures: report of the Quality Measurement and Reporting Subcommittee of the American Academy of Neurology. Neurology 2010;75:2021–2027. ; American Academy of Neurology Epilepsy Measure Development Panel and the American Medical Association-Convened Physician Consortium for Performance Improvement Independent Measure Development Process. Quality improvement in neurology: AAN epilepsy quality measures: Report of the Quality Measurement and Reporting Subcommittee of the American Academy of Neurology. Neurology 2011;76:94–99.
. Quality improvement in neurology: dementia management quality measures. Neurology 2013;81:1545–1549.
. Quality improvement in neurology: amyotrophic lateral sclerosis quality measures: report of the quality measurement and reporting subcommittee of the American Academy of Neurology. Neurology 2013;81:2136–2140.
. Quality improvement in neurology: distal symmetric polyneuropathy quality measures. Neurology 2014;82:1745–1748.
. The role for pragmatic randomized controlled trials (pRCTs) in comparative effectiveness research. Clin Trials 2012;9:436–446.
. A pragmatic view on pragmatic trials. Dialogues Clin Neurosci 2011;3:217–224.
. Practical clinical trials: increasing the value of clinical research for decision making in clinical and health policy. JAMA 2003;290:1624–1632.
. The clinically-integrated randomized trial: proposed novel method for conducting large trials at low cost. Trials 2009;10:14.
. Pragmatic randomised trials using routine electronic health records: putting them to the test. BMJ 2012;344:e55. American Academy of Neurology. Guidelines and Quality Measures. Available at: https://www.aan.com/Guidelines/ and https://www.aan.com/practice/quality-measures/. Accessed March 1, 2015. National Institute of Neurological Disorders and Stroke. Common Data Elements. Available at: http://www.commondataelements.ninds.nih.gov/. Accessed January 20, 2015. American Heart Association. Get With The Guidelines. Available at: http://www.heart.org/HEARTORG/HealthcareResearch/GetWithTheGuidelines/Get-With-The-Guidelines-Stroke_UCM_306098_SubHomePage.jsp. Accessed January 20, 2015.
. Challenges to ethics and professionalism facing the contemporary neurologist. Neurology 2014;83:1285–1293.
. Physician burnout: a neurologic crisis. Neurology 2014;83:2302–2306.
. Subgroup-based adaptive (SUBA) designs for multi-arm biomarker trials. Stat Biosci; doi: 10.1007/s12561-014-9117-1. Epub 2014 July 17.
. A Bayesian dose-finding design for oncology clinical trials of combinational biological agents. J R Stat Soc Ser C Appl Stat 2014;63:159–173.
. Bayesian estimation of inverse dose response. Biometrics 2008;64:1223–1230.
. Adaptive dose insertion in early phase clinical trials. Clin Trials 2013;10:216–224.
. Adaptive randomization for multiarm comparative clinical trials based on joint efficacy/toxicity outcomes. Biometrics 2009;65:876–884.
. Modified toxicity probability interval design: a safer and more reliable method than the 3 + 3 design for practical phase I trials. J Clin Oncol 2013;31:1785–1791.
. A phase I/II seamless dose escalation/expansion with adaptive randomization scheme (SEARS). Clin Trials 2014;11:49–59. Bayesian adaptive design for multi-dose, randomized, placebo-controlled phase I/II trials. Contemp Clin Trials 2012;33:739–748.
. Bayesian dose-finding in phase I/II clinical trials using toxicity and efficacy odds ratios. Biometrics 2006;62:777–784. Agency for Healthcare Research and Quality. Practice-Based Research Networks. Available at: http://pbrn.ahrq.gov/pbrn-registry/neurology-practice-based-research-network. Accessed April 3, 2015. Centers for Medicare & Medicaid Services. Physician Quality Reporting System. Available at: http://www.cms.gov/Medicare/Quality-Initiatives-Patient-Assessment-Instruments/PQRS/. Accessed May 16, 2015. American Academy of Neurology. Physician Quality Reporting System. Available at: https://www.aan.com/go/practice/pay/pqrs. Accessed May 16, 2015.
. The opportunities and challenges of pragmatic point-of-care randomised trials using routinely collected electronic records: evaluations of two exemplar trials. Health Technol Assess 2014;18:1–146.
. Ethics and informed consent for comparative effectiveness research with prospective electronic clinical data. Med Care 2013;51:S53–S57.
. An investigation of the efficacy of electronic consenting interfaces of research permissions management system in a hospital setting. Int J Med Inform 2013;82:854–863.
. Informed versus uninformed consent for prostate surgery: the value of electronic consents. J Urol 2006;176:694–699. ; CAPriCORN Team. CAPriCORN: Chicago Area Patient-Centered Outcomes Research Network. J Am Med Inform Assoc 2014;21:607–611. American Academy of Neurology. Axon Registry. Available at: https://www.aan.com/practice/axon-registry/. Accessed April 3, 2015.